“Can you book a table for four at 7:30 tonight at Brassaii?” the text reads. Not an uncommon refrain, asking one’s spouse, friend or family member to make the call in your stead. Maybe you’re busy, or have merely assigned someone else to do the deed. SMS is among the most easily-understood of all mobile services, which is why Tab, a Toronto-based startup optimizing the restaurant-going experience, from discovery to reservation to payment, turned to texting to remove the last vestiges of friction. “We were looking to be more flexible and more human” with the reservation experience, says Adam Epstein, Tab’s CEO and co-founder. The company added the ability to book tables at certain Toronto restaurants in its last update, but found adoption slow. “There’s too much rigidness” when using an app, he acknowledges. The fix, Tab Talk, was an obvious solution after both the success of Path Talk, which allowed users to contact businesses directly, and Magic, an SMS-based on-demand service launched earlier this year in San Francisco. While a lot of work is being done on Tab’s end to automate the process, the core value of the service is that a real person is holding a phone at the other end. And while Tab’s app allows reservations for only a few restaurants, having a real person intervening on your behalf expands the pool to all of the company’s partners. Epstein pictures an ideal scenario, where texting Tab leads to a reservation, which leads to attendance at a lovely restaurant, during which one has a beautifully-prepared meal with great service that, once completed and the cheque reviewed, is followed by merely walking out without ever holding a credit card or looking at a payment terminal. Meanwhile, because the customer used Tab to book and pay, the server knows his or her name and face, making the interaction more personal. 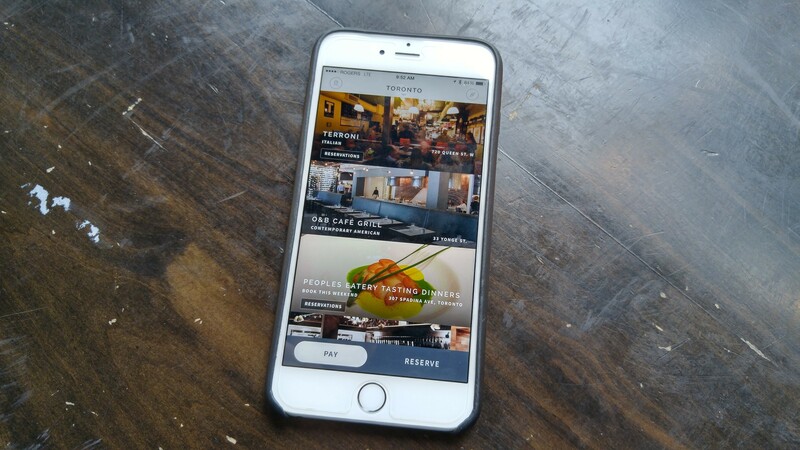 “It provides an amazing amount of value for the partner restaurants, and satisfaction for the customer,” says Epstein, noting that opening day of SMS service saw more reservations than during the entire six weeks the feature had been available in the company’s app. Initially I was skeptical of this. Why would texting a restaurant provide a better experience than talking with someone over the phone? While the amount I talk on the phone to friends and family has dropped with the rise of instant messaging, there is something nice about chatting with a friendly voice. Except, Epstein reminds me as I recall countless bad experiences, those voices are rarely friendly, surrounded by the deafening bustle of a front-of-house. As texting has become a natural extension of one’s fingertips, available on every phone, smart or otherwise, so too has the restaurant industry adapted to newer standards. “Collectively, chat is more popular than apps,” Epstein tells me. And he’s right. While the volume of SMS-based messages has begun dropping due to the proliferation of data-driven IM services like WhatsApp, Kik, BBM and Facebook Messenger, its ubiquity and simplicity continues to reinforce its necessity. 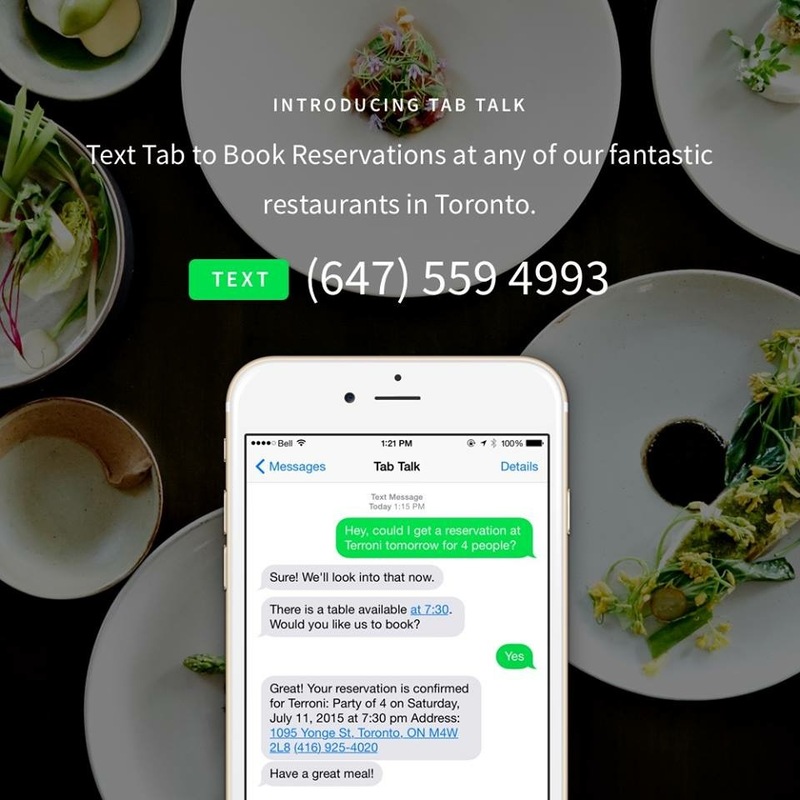 Tab Talk is available in Toronto by texting 647-559-4993, supporting over 100 of the city’s best restaurants.